Bijou Homes, a residential community within Appolonia City, is selling fast, with more than 40 percent of the first phase already sold. The Bijou Homes neighbourhood was launched in November 2017 by President Nana Addo Dankwa Akufo-Addo, who heralded GHL Bank and Appolonia City for their partnership to build high-quality affordable homes with flexible payment options, including mortgages from 10 to 15 years. 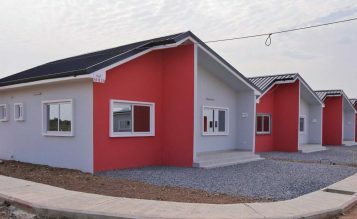 “Bijou Homes meets the varied needs of resident and non-resident Ghanaians who wish to purchase their first homes or additional units for investment,” said Bright Owusu-Amofah, CEO of Appolonia City. Owusu-Amofah added that Appolonia City’s well-planned infrastructure and amenities in a secure and friendly environment are suitable for more residential developments. “With access to facilities such as shops, schools, hospitals and recreational centers, you enjoy the convenience and comfort of a well-planned community,” he said. Upon completion, Bijou will have 2,000 homes. The first phase, which is currently in handover to new owners, offers 1- and 2-bedroom expandable semi-detached homes, as well as terraced houses. The neighbourhood has an on-site management office, 24-hour security and an underground drainage system. The community features landscaping, well-paved roads and modern architecture. “When it comes to innovative housing solutions, Bijou Homes has designs to meet every individual and family need, including expandable homes, so your house can grow with you,” said Ama Osae-Addae, head of GHL property services. To realise their dream of home ownership or investment at Bijou Homes with the help of a mortgage, buyers are encouraged to contact GHL Bank on 0546 403074. Bijou Homes is located at Appolonia City, offering 1- and 2-bedroom (expandable to 3) multi-functional, modern homes for young professionals and growing families. At a location which offers superior urban infrastructure, housing and places of work, you have the opportunity to enjoy the comforts of a gated community, 24/7 security, communal amenities and more at very affordable prices.